Our streams, rivers, creeks, lakes and our oceans are being contaminated with plastics, glass, cleaning agents, waste oils and other petroleum based products among many other pollutants, turning them uninhabitable for creatures that live in the water, and unfit for human consumption and swimming. As the world is looking to clean up its act in and around waterways we can start with the basics at our own back door. 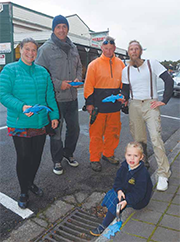 With Fish on Drains we can start educating within our own communities about the consequences of contaminates in our stormwater drains. At Fish on Drains we practice what we preach, from production to installation we have the environment in mind, ensuring every aspect of Fish on Drains is kind to our planet. Being made from polycarbonate they will not leach any contaminates into the waterways. Our children are the future so let’s teach them about preserving our planet. Kids spend a great deal of time out walking and biking around our streets, seeing Fish on Drains and reading the words prompting them to ask questions and learn about keeping our waterways clean. Please contact us directly for large or international orders (over 30). 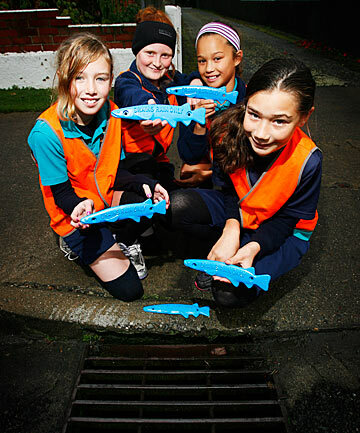 It's World Ocean Day and the children at Springlands School in Blenheim are celebrating by challenging the town to keep its drains cleaner.The school's Fish on Drains project started last year, when they fixed a plastic blue fish above a stormwater drain, reminding people not to pollute the waterways.